Cone-beam computed tomography (CBCT) is a three-dimensional (3D) imaging modality that is useful in the evaluation of the maxillofacial structures for diagnostic and treatment planning purposes.,,, It shows the anatomical features of the maxilla and mandible without superimposition nor distortion.,, In the maxilla, CBCT provides an accurate evaluation of bone quality, quantity, and the relationship between maxillary sinus and the root apices of posterior teeth. 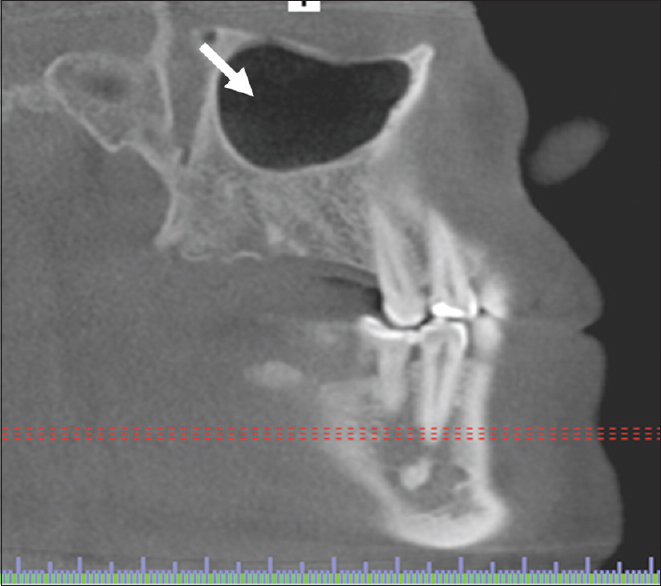 CBCT is considered as a preoperative diagnostic tool for implant placement, particularly in cases that require sinus lift surgery.,,, In addition, CBCT is a helpful tool for the proper assessment of the maxillary sinuses in all three dimensions. Raghav et al. recorded the prevalence of incidental maxillary sinus pathologic findings by CBCT in a cohort study in which age ranged from 10 to 69 years. Their results revealed a high prevalence of incidental maxillary sinus abnormalities in a sample of asymptomatic dental patients. In addition, Tadinada et al. investigated the diagnostic efficiency of CBCT compared to panoramic imaging. They found that the percentage of maxillary sinus pathosis was 72% in the examined population. In addition, CBCT imaging was significantly more reliable in detecting maxillary sinus pathosis compared to panoramic imaging. There are no available studies that assess the prevalence of anatomical variations and pathosis of the maxillary sinuses in Jeddah, Saudi Arabia. Thus, the aim of this study was to assess the prevalence of maxillary sinuses status in regard to anatomical variations and pathosis using CBCT as a diagnostic tool, in asymptomatic patients who are willing to receive dental implants at King Abdulaziz University Dental Hospital (KAUDH) in Jeddah, Saudi Arabia. A retrospective chart review of the implant clinic at KAUDH of 263 patients was randomly selected to asses both maxillary sinuses at the right and left sides in the same patient. A total number of 526 CBCT images of both maxillary sinuses were included for evaluation in this study. Exclusion criteria included unsatisfactory quality of images, incomplete coverage of the maxillary sinuses, and symptomatic patients. CBCT images were evaluated for the following findings: number of teeth in intimate relation with the maxillary sinus and the presence of septa (as anatomical variations) and the presence, extent, and configuration of mucosal thickening (MT) as a sign of pathosis. All the patients were imaged using the iCAT scanner (Imaging Sciences International, Hatfield, PA, USA) using the exposure settings recommended by the manufacturer and a voxel size that ranged from 0.25 to 0.4 mm. Two calibrated dental radiology consultants evaluated the CBCT of the maxillary sinus images using the Vision software (Imaging Sciences International, Hatfield, PA, USA). The interobserver and intraobserver agreement values were calculated using Cohen's kappa test. Statistical analysis was done using IBM SPSS software version 21.0 (Chicago, IL, USA). Simple descriptive statistics were used to define characteristics of our study variables using percentages, mean, and range. The differences between the groups were assessed using the Chi-square test, and the level of significance was set at P < 0.05. A written consent was obtained from all patients approving the use of their data for the research project. This project was approved by the Research Ethical Committee Review Board from King Abdulaziz University, Faculty of Dentistry. This project was approved by the committee and was in full accordance with the World Medical Association Declaration of Helsinki. Out of the 263 patients who were included in this study, 140 were female and 96 were male. The mean age was 35.68 years and the range was 13–75 years old. The Cohen's kappa scores for both interobserver and intraobserver agreement values varied from 0.84 to 0.96. The highest prevalence of dental proximity to the sinus wall was between the first left premolars and the anterior sinus wall [57.14%; [Table 1]], followed by the second right premolars [56.14%; [Table 1]]. Only a few cases out of the 526 images demonstrated a proximity of the first molars and none of the second molars to the anterior sinus wall [Table 1]. Our results revealed that the presence of septa in the right and left maxillary sinuses was high, 54.37% and 57.41%, respectively [Table 2]. 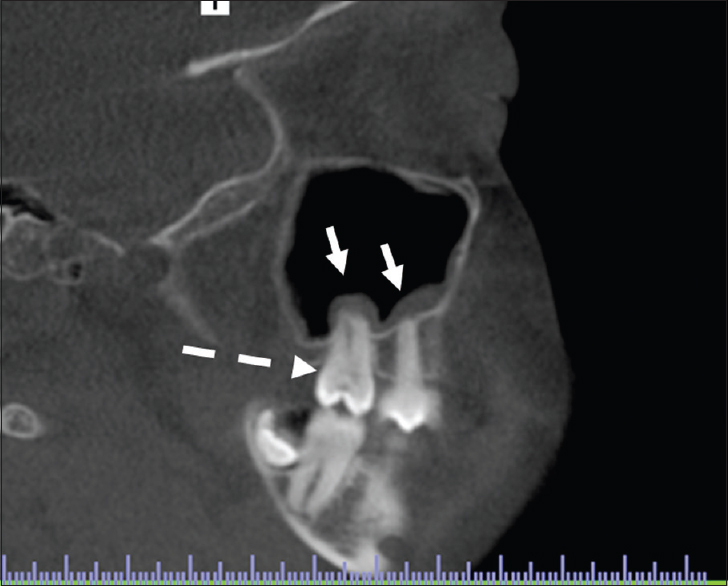 Representative CBCT images of a healthy (clear) maxillary sinus and the presence of septa in the maxillary sinus are shown in [Figure 1] and [Figure 2], respectively. We characterize the MT (mucositis) according to the location and configuration using the sagittal view. 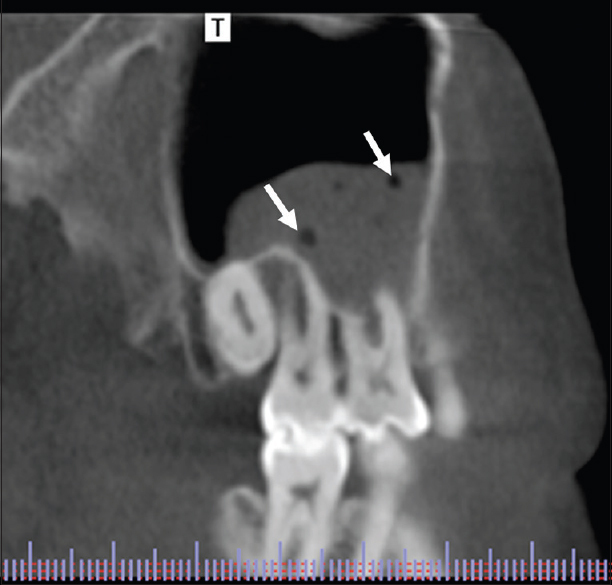 Irregular MT configuration of the maxillary sinus is shown in [Figure 3] compared to the healthy maxillary sinus shown in [Figure 1]. In [Figure 4] and [Figure 5], we represented examples of MT in the maxillary sinus, localized versus generalized. 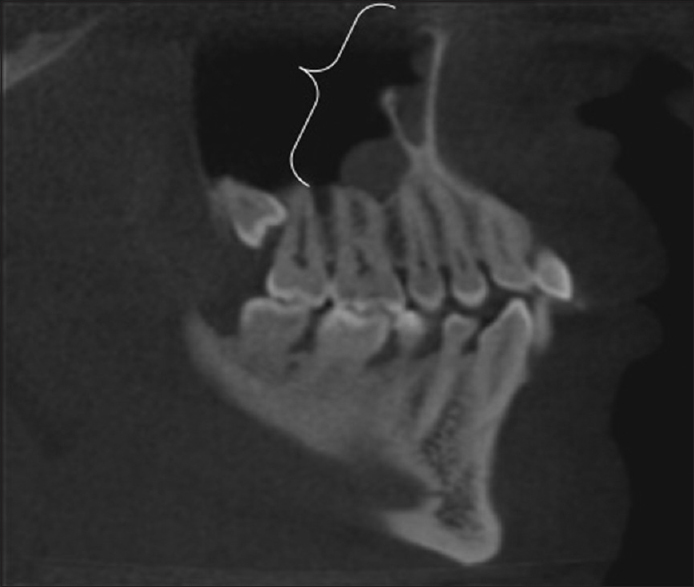 [Figure 6] is an example of localized odontogenic MT that resulted from deep caries in the maxillary second molar. Our study also investigated the causes of the MT of the maxillary sinuses, odontogenic versus nonodontogenic in origin. Interestingly, odontogenic mucositis was the least common finding. The majority of MT cases (87.07%) were not related to teeth pathosis as shown in [Table 3]. The dental conditions related to the odontogenic mucositis are mostly deep fillings (3.42%), followed by root canal treatment (3.23%) and periapical pathosis (3.23%) [Table 3]. MT in the maxillary sinuses due to pathosis was noted with varying degrees [Table 4]. The total prevalence of maxillary sinuses pathosis was 52.7% [Table 4]. The prevalence of generalized MT in the left maxillary sinus was similar to that in the right sinus, 38.78% and 36.12%, respectively [Figure 7] and [Table 4]; P> 0.05]. 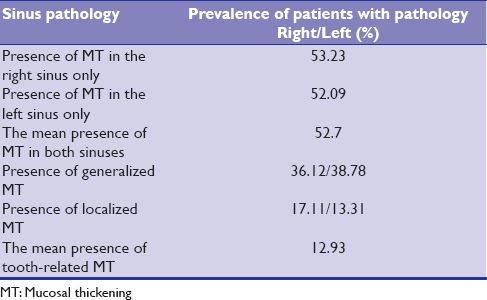 In addition, the prevalence of localized MT in the left maxillary sinus was also similar to that of the right sinus, 13.31% and 17.11%, respectively [Figure 7] and [Table 4]; P> 0.05]. There was no statistical significance in the presence of MT between left and right maxillary sinuses (P > 0.05). The first molars were the most commonly related teeth to areas of MT, followed by the second molars with a prevalence of 41.79% and 26.86, respectively [Table 5]. The prevalence of maxillary sinus pathosis in our studied population from Saudi Arabia was high (52.7%). This is in agreement with other studies where they others found the prevalence of maxillary sinus pathosis to be (72%) and (94%). This higher prevalences can be explained, at least in part, due to the fact that these studies included all paranasal sinuses not just the maxillary sinuses compared to our study. In our study, the prevalence of maxillary sinus septa was relatively high on both sides. In 2012, Pommer et al. showed a significantly lower prevalence of maxillary sinus septation in the Asian population. The variety of the results could be due to the different septa definition criteria of their study compared to ours, and they also used 2D panoramic radiographs that most probably underestimated the presence of septa compared to our study that included CBCT as diagnostic method. According to the position statement released by the American Academy of Oral and Maxillofacial Radiology, cross-sectional imaging such as CBCT is recommended before implant placement. This reduces the risk of complications such as sinus membrane perforation, postoperative sinusitis, and graft infection. A modification of the surgical techniques is required to avoid these complications in the presence of septa. In the current study, the prevalence of maxillary sinus disease from an odontogenic origin was 12.93%. Our results are in agreement with Mehra and Jeong study where they reported an odontogenic origin of maxillary sinusitis in 10%–12% of their studied cases. In addition, in our population, dental proximity to the sinus wall was the first left premolars followed by the second right premolars. Our results are in contrast to others where the second and first molars showed a closer proximity to the maxillary sinus compared to premolars. One limitation of our study was the factor of allergies, as the cause was not always well documented. Further controlled studies are needed to determine the extent of radiographic signs of maxillary sinus pathosis (most commonly MT) that can be safely grafted for implant treatment without hindering the success rate of these implants. Proper management and referral to an ENT specialist in case of maxillary sinus pathosis that is nonodontogenic in origin is important before any surgical intervention. The prevalence of maxillary sinus mucositis in our population was high. Thus, preoperative radiographic assessment using CBCT is highly recommended before dental implant placement to allow the proper assessment and diagnosis of maxillary sinus disease, if present. The assessment of maxillary sinus disease before surgical intervention will provide a higher standard of care and decrease the risk of complications and failures of dental implants. 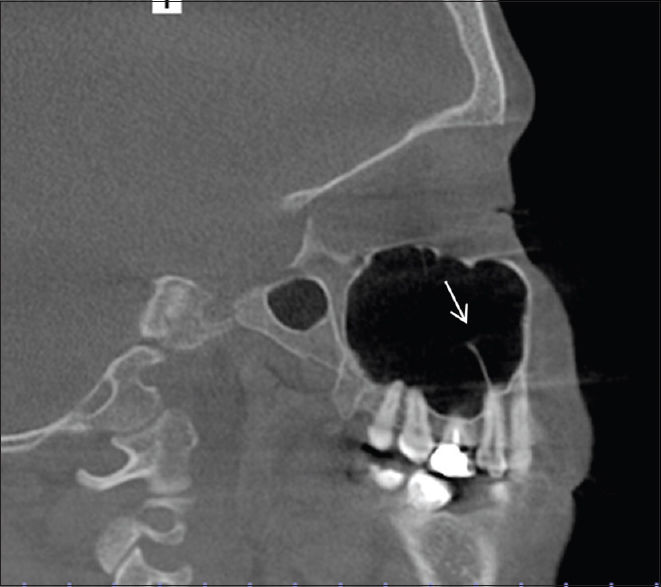 Soikkonen K, Ainamo A. Radiographic maxillary sinus findings in the elderly. Oral Surg Oral Med Oral Pathol Oral Radiol Endod 1995;80:487-91. Ruprecht A, Lam EWN. Paranasal sinuses. In: White SC, Pharoah MJ, editors. Oral Radiology. 6th ed. Louis: Mosby Elsevier; 2009. p. 506-12. Underwood AS. An inquiry into the anatomy and pathology of the maxillary sinus. J Anat Physiol 1910;44:354-69. Pommer B, Ulm C, Lorenzoni M, Palmer R, Watzek G, Zechner W, et al. Prevalence, location and morphology of maxillary sinus septa: Systematic review and meta-analysis. J Clin Periodontol 2012;39:769-73. Dula K, Mini R, van der Stelt PF, Buser D. The radiographic assessment of implant patients: Decision-making criteria. Int J Oral Maxillofac Implants 2001;16:80-9. Parks ET. Computed tomography applications for dentistry. Dent Clin North Am 2000;44:371-94. Schulze D, Heiland M, Blake F, Rother U, Schmelzle R. Evaluation of quality of reformatted images from two cone-beam computed tomographic systems. J Craniomaxillofac Surg 2005;33:19-23. Chavda R, Mannocci F, Andiappan M, Patel S. Comparing the in vivo diagnostic accuracy of digital periapical radiography with cone-beam computed tomography for the detection of vertical root fracture. J Endod 2014;40:1524-9. Shimura M, Babbush CA, Majima H, Yanagisawa S, Sairenji E. Presurgical evaluation for dental implants using a reformatting program of computed tomography: Maxilla/mandible shape pattern analysis (MSPA). Int J Oral Maxillofac Implants 1990;5:175-81. Cavalcanti MG, Yang J, Ruprecht A, Vannier MW. Validation of spiral computed tomography for dental implants. Dentomaxillofac Radiol 1998;27:329-33. Savolainen S, Eskelin M, Jousimies-Somer H, Ylikoski J. Radiological findings in the maxillary sinuses of symptomless young men. Acta Otolaryngol Suppl 1997;529:153-7. DelBalso AM, Greiner FG, Licata M. Role of diagnostic imaging in evaluation of the dental implant patient. Radiographics 1994;14:699-719. Solar P, Gahleitner A. Dental CT in the planning of surgical procedures. Its significance in the oro-maxillofacial region from the viewpoint of the dentist. Radiologe 1999;39:1051-63. Fatterpekar GM, Delman BN, Som PM. Imaging the paranasal sinuses: Where we are and where we are going. Anat Rec (Hoboken) 2008;291:1564-72. Cagici CA, Yilmazer C, Hurcan C, Ozer C, Ozer F. Appropriate interslice gap for screening coronal paranasal sinus tomography for mucosal thickening. Eur Arch Otorhinolaryngol 2009;266:519-25. Fugazzotto PA, De PS. Sinus floor augmentation at the time of maxillary molar extraction: Success and failure rates of 137 implants in function for up to 3 years. J Periodontol 2002;73:39-44. Raghav M, Karjodkar FR, Sontakke S, Sansare K. Prevalence of incidental maxillary sinus pathologies in dental patients on cone-beam computed tomographic images. Contemp Clin Dent 2014;5:361-5. Tadinada A, Fung K, Thacker S, Mahdian M, Jadhav A, Schincaglia GP, et al. Radiographic evaluation of the maxillary sinus prior to dental implant therapy: A comparison between two-dimensional and three-dimensional radiographic imaging. Imaging Sci Dent 2015;45:169-74. 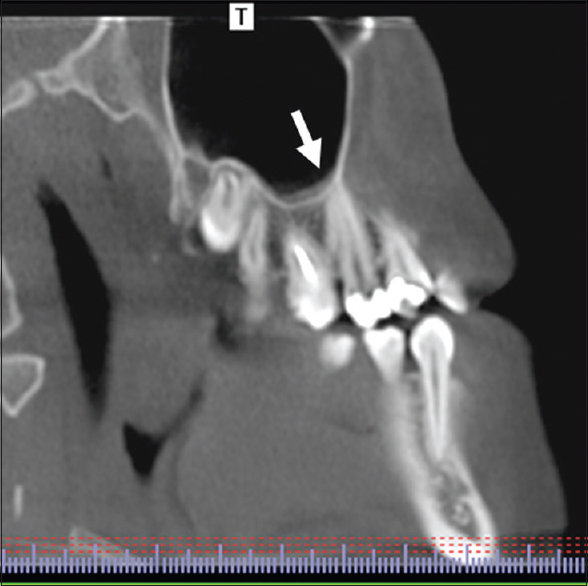 Mehra P, Jeong D. Maxillary sinusitis of odontogenic origin. Curr Infect Dis Rep 2008;10:205-10. Tyndall DA, Price JB, Tetradis S, Ganz SD, Hildebolt C, Scarfe WC, et al. Position Statement of the American Academy of Oral and Maxillofacial Radiology on selection criteria for the use of radiology in dental implantology with emphasis on cone beam computed tomography. Oral Surg Oral Med Oral Pathol Oral Radiol 2012;113:817-26. Kang SH, Kim BS, Kim Y. Proximity of posterior teeth to the maxillary sinus and buccal bone thickness: A biometric assessment using cone-beam computed tomography. J Endod 2015;41:1839-46.